Our SRI-Rice Selected News Updates for November (on ScoopIt) are now available. The November additions to our website are also ready, so you can find what's new on SRI-Rice online since last time you checked in! Some of the SRI-Rice statistics for November 2014 are as follows: 3,851 unique visitors (3,678 last month) from 95 countries (92 last month) viewed 10,386 pages (10,157 last month) on the SRI website. Total Facebook views: 1,917 (1,084 last month) with 1,422 all-time likes. Twitter followers: 955 (20 new this month). Erika Styger and Gaoussou Traore (Regional Coordinator of the SRI Scaling Up project for West Africa) traveled for 10 days in India, visiting with KGVK Agro in Ranchi, Jharkand State and the NGO Pran in Gaya, Bihar State, many SRI farmers who were in the process of harvesting rice and planting winter crops. The National Consortium for SRI hosted Erika and Gaoussou’s visit in New Delhi. Prabhat Gautam, who completed a MPA degree from the Cornell Institute for Public Affairs in May 2014, joined SRI-Rice in November to work on SRI-Rice's projects on citizen science and climate smart agriculture. A Workshop on Small-Scale Rice Production Equipment for SRI was held November 1-3, 2014, at the Asian Institute of Technology (AIT), Bangkok, Thailand. Sponsored by SRI-Rice and the Asian Centre of Innovation for Sustainable Agriculture Intensification (ACISAI), the event was attended by 60 participants from 12 countries. The presentations are available on the SRI-Rice website. A field trip to farms associated with the Thailand Weekend Farmers Network included demonstrations of SRI weeders and markers as well as group transplanting using the "dart method" that is gaining popularity with the network farmers throughout Thailand. Our SRI-Rice Selected News Updates for September/October (on ScoopIt) are now available. The October additions to our website are also ready, so you can find what's new on SRI-Rice online since last time you checked in! Some of the SRI-Rice statistics for October 2014 are as follows:3,678 unique visitors (3,754 last month) from 92 countries (97 last month) viewed 10,157 pages (10,342 last month) on the SRI website. Total Facebook views: 1,084 (2,236 last month) with 1,367 all-time likes. Twitter followers: 935 (26 new this month). Total YouTube views: 40,089 (1,111 new this month). We have 388 presentations (all time) uploaded and 140 subscribers on our Slideshare site. There are now 648 papers (17 new this month) in our Refworks research database. 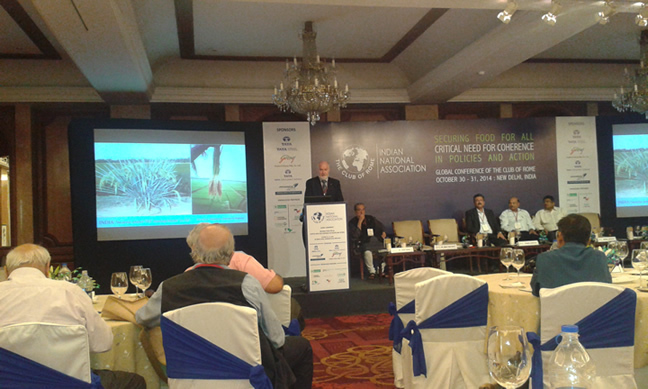 Norman Uphoff participated in in the Global Conference on Securing Food for All: The Critical Need for Coherence in Policies and Action, which was organized by the Indian National Association for the Club of Rome and convened October 30-31, 2014 at the Taj Mahal Hotel in New Delhi, India. He spoke in the opening plenary session, for which Dr. M.S. Swaminathan and the Cabinet Secretary, Mr. Ajit Seth, were the chief guests, and on a panel the second day of the conference. Fifty participants from 16 countries attended the Workshop on Building Alliances around SRI and Agro-Ecology, which was organized by Oxfam and SRI-Rice. The event was held October 27-28, 2014, at the Maple Hotel, in Bangna, Bangkok, Thailand. The meeting provided a forum for discussing how respective and collaborative efforts can contribute to the more rapid and effective scaling-up of SRI use in participants’ countries and regions and around the world. Participants drafted and signed an open letter to the IRC during the workshop encouraging those attending the upcoming 4th International Rice Congress (see item directly below) to keep in mind the needs of small farmers and to consider the benefits of SRI. 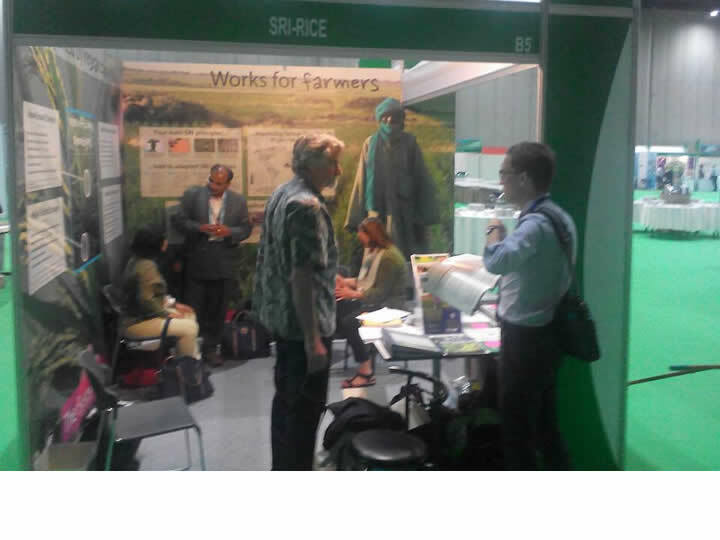 SRI-Rice was represented at the 4th International Rice Congress (IRC) by Norman Uphoff, Erika Styger, Lucy Fisher, Devon Jenkins and Zhoucen Feng, as well as others from the Ithaca SRI community: Olivia Vent (Lotus Foods), Ed Baxter (SRI Global, Inc.) and Marguerite Uphoff (SRI health advisor). SRI-Rice, with assistance from SRI Global, Inc., and Oxfam, organized a booth (right) with numerous publications and a Cambodian rice dragon weeder. Oral presentations were made by Erika (SRI Research Review) and Zhoucen, SRI Intern (SRI in China). Devon and Lucy presented posters on Improving and Scaling Up SRI in West Africa and Development of Equipment for SRI, respectively. Other posters about SRI by members of the global SRI community presented at the 4th IRC can be found on the SRI website. Anil Kumar Verma, executive director of the Indian NGO PRAN, presented a seminar at Cornell University on Scaling up the System of Rice Intensification and the System of Wheat Intensification in Bihar, India, on September 15 at 12:20PM - (see video and PowerPoint). On September 18, Ashwini Chhatre, faculty at the Indian School of Business in Hyderabad, will give a talk at 4:00PM entitled The Challenges of Rainfed Agricultural Development in India: Where System of Crop Intensification (SCI) Options Might Fit In. Both presentations took place in 102 Mann Library at Cornell. Norman Uphoff, SRI-Rice Senior Advisory, was a panelist at the workshop on "Innovation for Vulnerable Farmers: Drought and Water Scarcity Adaptation Technologies Workshop" held on September 10-12, 2014, at Harvard University. The workshop was sponsored by the Initiative on Innovation and Access to Technologies for Sustainable Development at the Sustainability Science Program at Harvard University. Sean Finnerty, a junior studying International Agriculture and Rural Development, has joined SRI-Rice as a research assistant. John Lowry, also a Cornell junior, is volunteering his time this year to work on SRI social media. Aravind Boddupalli, our summer intern working on the SRI equipment access project, has retuned to the University of Minnesota. Zhoucen Feng, Haiti intern with SRI-Rice and the iF Foundation, is currently back in Ithaca helping SRI-Rice prepare for the International Rice Congress (IRC) coming up in Bangkok in October. Zhoucen will also present a paper on SRI research in China at the IRC. A Technical Manual for SRI in West Africa, which was written by Erika Styger and Devon Jenkins for the project on Improving and Scaling up of the System of Rice Intensification in West Africa, is now available online. The manual, currently available English and soon to be available online in French, was first released at the August 4-10 regional project workshop held in Kpalimé, Togo. As much of the comprehensive information contained in the manuals is relevant for SRI in other parts of Africa and the world, they are a valuable addition the Global SRI Community's technical resources. 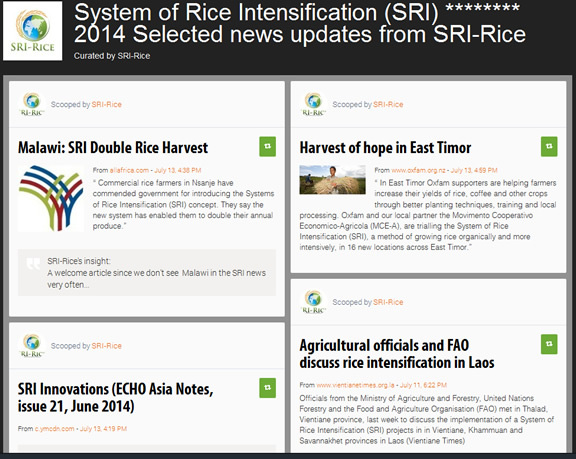 Our SRI-Rice Selected News Updates for June (on ScoopIt) are now available. The July additions to our website are also ready, so you can find what's new on SRI-Rice online since last time you checked in! Some of the SRI-Rice statistics for June 2014 are as follows: 3,723 unique visitors from 95 countries viewed 11,284 pages on the SRI website. Total Facebook views: 1863. Twitter followers: 807 (12 new this month). total YouTube views: 35,991 (830 new this month). We now have 385 presentations (al time) uploaded on Slideshare acct. and 579 papers in our Ref Works research database. Devon Jenkins and Erika Styger traveled to West Africa for the first major SRI "training of trainers" and technical exchange workshop, which was implemented in conjunction with the project on Improving and Scaling Up the System of Rice Intensification in West Africa. The workshop, which was held August 4-10 in Kpalimé, Togo, had participants from 12 West African countries. Erika also visited Ghana to provide support for the World Bank-sponsored SRI project being undertaken with the West Africa Agricultural Production Program's (WAAPP) National Centre of Specialisation for Rice. 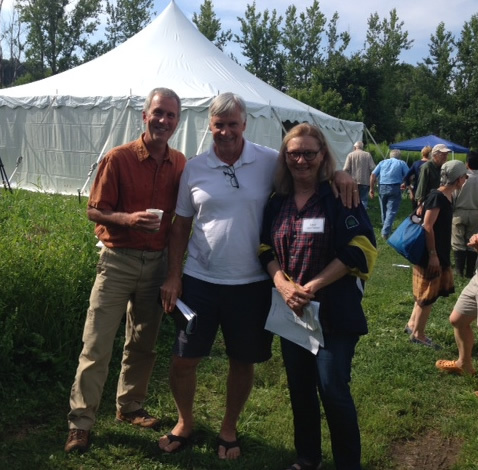 Lucy Fisher participated in the Fifth Annual Northeast USA Rice Conference in Westminster, Vermont, which was held August 2, 2014, at the Akaogi farm. At the event, information was provided about SRI projects in the USA being undertaken by Jim Lyons in New Jersey and Glenn Roberts in South Carolina (at right); Glenn is involved in the SARE SRI program with Clemson University Coastal Research and Education Center's Organic Research Farm (CREC-ORF). Our SRI-Rice Selected News Updates for June (on ScoopIt) are now available. The June additions to our website are also ready, so you can find what's new on SRI-Rice online since last time you checked in! Some of the SRI-Rice statistics for June 2014 are as follows: 3,723 unique visitors from 95 countries viewed 11,284 pages on the SRI website. Total Facebook views: 1863. Twitter followers: 807 (12 new this month). total YouTube views: 35,991 (830 new this month). We now have 385 presentations (all time) uploaded on Slideshare acct. and 579 papers in our Ref Works research database. Norman Uphoff gave several presentations the Workshop on Changes in Rice Production and Rural Livelihoods: New Insights on the System of Rice Intensification (SRI) as a Socio-Technical Movement in India, which was held June 19-21 at the National Academy of Agricultural Sciences (NASC) in New Delhi. PowerPoints of his talks are now available: 1) Revising Agronomic and Socio-Economic Paradigms for Crop Improvement: Findings from SRI Research Globally and 2) System of Rice Intensification (SRI) - Implications for Indian Development Policy: A Global Perspective and Some Specific Suggestions. Presentations were also given by people previously working with us at Cornell: Pratyaya Jagannath (formerly a Cornell graduate student and SRI-Rice research assistant) and Shambu Prasad (a 2014 Fulbright Fellow with SRI-Rice/International Programs), both of whom were instrumental in organizing the event. • Aravind Boddupalli (right), an undergraduate at the University of Minnesota, will be joining SRI-Rice as a summer research assistant after attending the International SRI Research Conference in New Delhi. working on the equipment initiative and the SRI research databases. • Zhoucen Feng has returned to her internship in Haiti in early June to finish up monitoring SRI field trials with iF Foundation. (See her new blog postings.) She spent April and May at the SRI-Rice office working on the Chinese language SRI research materials (see map) and helping us figure out how to find and acquire rice production equipment from China and Japan. • Sidney Madsen is also joining us to work on the research and media sections of the Conservation Agriculture website, which is a collaborative project with the Cornell Conservation Agriculture Group. Our SRI-Rice Selected News Update (on ScoopIt) for May is now available (and will be updated monthly). Readers have responded positively to this new format. The May additions to our website is also ready, so you can find what's new on SRI-Rice online. During May 2014, 4,506 unique visitors from 113 countries (99 last month) viewed 12,318 pages on the SRI-Rice website. There were 943 Facebook views. Twitter followers are now 795 (46 new during May). Yezdi Karai visited Cornell University May 22-23 to talk about the new Usha Martin University (UMU) in Jharkhand state, India, which is planning to set up an SRI Institute. He also presented a seminar entitled SRI: Experience and Opportunities in Jharkhand State, India. Karai is Pro-Chancellor and member of the Board of Directors for UMU in Jharkhand state, a board member of the NGO KGVK (Krishi Gram Vikas Kendra) and founder and director of KGVK Agro, a company that creates diversified livelihood opportunities in agriculture for village communities. Xingyu Luo, plant sciences, and Christine Ly, biological sciences, have graduated from Cornell and are (sadly) leaving the SRI-Rice office. Xingyu, who worked on the SRI-Rice research database, will be going to graduate school at the University of Wisconsin. Christine Ly, who maintained the contact database and worked on several research projects, is headed for medical school. Jeevan Gyawali, who provides technical support for the SRI-Rice website will be spending the summer with General Electric in Boston. We wish them all well! Shambu Prasad Returns to India! 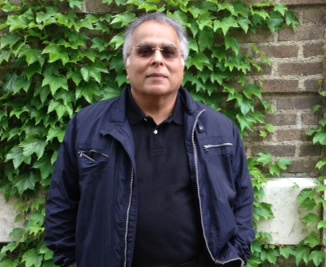 Shambu Prasad C., Professor of Rural Management and Development at Xavier Institute in Bhubaneswar, Odisha, and Fulbright fellow with SRI-Rice at Cornell, has finished his 8 month assignment with SRI-Rice / International Programs at Cornell University. On May 2, Shambu and his family left Ithaca for Bhubaneswar, India. We will miss him at the office! Erika Styger traveled to Zambia April 15 - May 1, 2014, to work with the NGO Community Markets for Conservation (COMACO) on a rice production systems diagnostic in the northern and eastern regions of Zambia. (See report). She also assisted in the design of a four-year SRI project funded by the Royal Norwegian Embassy. Henry Ngimbu, who has worked with SRI-Rice on projects in Zambia and elsewhere in Africa, also joined the group. Our SRI-Rice Ad Hoc Seminar Series has a new page (http://sri.ciifad.cornell.edu/aboutsri/aboutus/seminars/index.html) where you can follow our group presentations at Cornell. Anyone who would like to be on our SRI-Rice seminar mailing list should contact the SRI-Rice Director of Communications. Shambu Prasad (shown at right on his way to the Social Justice Fair) gave a presentation at the Science for the People Conference, held April 11-13 at the University of Massachusetts, Amherst. His presentation, entitled "The knowledge commons in agriculture: Emerging peoples science initiatives in India," was part of the Agricultural Science and Food Justice panel. On April 23, Prasad will give a seminar (4:30pm, G08 Uris Hall) at Cornell sponsored by the South Asia Program. The title is "Agricultural transformations: Some insights on agency and innovation from SRI in India." Norman Uphoff will present a paper entitled "Opportunities to get more food production and climate-resilience by producing better phenotypes from available genotypes; Mobilizing services of the plant-soil microbiome" at the Seventh International Biennial Conference, BioVisionAlexandria 2014. The theme of BioVisionAlexandria 2014, will be which will be held April 7-9, 2014, in Alexandria, Egypt, is "New Life Sciences: The Next Decade." Erika Styger participated in Borlaug Summit on Wheat for Food Security, held March 25-28, 2014, in Ciudad Obregón, Mexico. The Katerva Award highlights the most innovative projects from around the world and has been referred to as "the Nobel Prize of Sustainability." (See press release on the SRI-Rice website. SRI-Rice at Cornell University has been selected as a finalist for the 2013 Katerva Award in the Food Security category. Katerva also allows the public to help choose from the finalists the innovation they feel has the most to offer the world. The public is invited to vote for the People's Choice Award from among the finalists March 7-28, 2014, on the Katerva website. Please cast your vote for SRI-Rice and help SRI to gain more recognition worldwide. March 3-5, Devon traveled to the Parakou region in northern Benin to meet with the local NGO DEDRAS and the Government agricultural extension service, CARDERE, and to visit with farmers who had been trained in SRI by them in 2013. March 5-8, he visited southern Togo to meet with WAAPP representatives, GRAPHE and other local organizations, and Peace Corps staff in Lomé. Devon also visited rice farmers who were testing and adopting SRI in the largely-irrigated Zio River Valley. Shambu Prasad C., Professor of Rural Management and Development at Xavier Institute in Bhubaneswar, Odisha, and Fulbright fellow with SRI-Rice at Cornell, presented a seminar entitled "Uprooting Rice Science? Scientific Controversies and SRI" on March 3, 2014, on the Cornell University campus. The event was hosted by the Science Studies Research Group in the Department of Science and Technology Studies. Under the regional project Improving and Scaling up SRI in West Africa, Erika Styger visited Liberia, from Feb 22 - March 2, 2014, to provide technical backstopping and program support to the newly initiated national SRI program under WAAPP Liberia. Styger was interacting with programs active in the rice sector (through the Ministry of Agriculture, Oxfam, USAID funded projects among others), visited field sites for first SRI implementation (with farmers and at research station of CARI), and provided a one-day practical training to farmers and technicians. Styger gave a presentation to the Agriculture Coordination Committee Meeting at the Ministry of Agriculture, in Gardnerville, Monrovia with 48 people attending from Government, multi-lateral and bilateral partnerships, donors, NGOs, farmer organization and the private sector. The SRI-Rice West Africa team (Erika Styger, Devon Jenkins, Tom Archibald), traveled to Porto Novo, Benin, to attend the Launching Workshop of the Regional Project: 'Improvement and Scaling up of SRI in West Africa', which was held February 17-19, 2014. The event was co-organized and co-facilitated by SRI-Rice together with CNS-Riz from Mali, and funded by the World Bank under the auspices of CORAF/WECARD. WAAPP national coordinators, WAAPP monitoring and evaluation specialists, national focal points for each country and champions (farmers and technicians) participated in setting up the program for 2014 for all 13 countries. Adusumilli Ravindra, Director of the Indian NGO WASSAN (Watershed Support Services and Activities Network), visited the SRI-Rice Center on February 17, 2014. After meeting with the SRI-Rice team, he presented a seminar to the Cornell Community entitled Rice in Water-Constrained Areas: Has the Potential of SRI Been Realized? Ravindra is currently pursuing his PhD from the Wageningen University and Research Center. His focus is evaluating the spread of the SRI in groundwater-irrigated rice areas of Andhra Pradesh, India. SRI-Rice has finalized the long-awaited monograph entitled SCI - The System of Crop Intensification: Agroecological innovations for improving agricultural production, food security, and resilience to climate change. In addition to SRI-Rice pieces by Erika Styger and Norman Uphoff, articles have been contributed by many of our SRI/SCI partners: Binju Abraham (PRADAN, India), Hailu Araya (Institute for Sustainable Development, Ethiopia), Tareke Berhe (Agricultural Transformation Agency, Ethiopia), Sue Edwards (Institute for Sustainable Development, Ethiopia), Biksham Gujja (AgSri Agricultural Services Pvt. Ltd., India) Ram Bahadur Khadka (Nepal Agricultural Research Council, Nepal), Y.S. Koma, (CEDAC, Cambodia), Debashish Sen (People's Science Institute, India), Asif Sharif (FarmMore Technology Pvt. Ltd., Pakistan), and Anil Verma, (PRAN, India). The hard copy edition in India will be co-published by Aajeevika (National Rural Livelihood Mission). 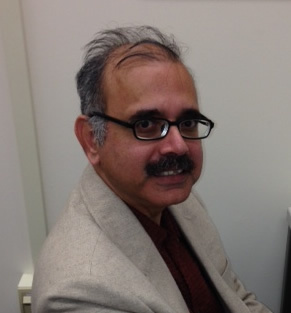 Shambu Prasad, Professor of Rural Management and Development at Xavier Institute in Bhubaneswar, Odisha, and Fulbright fellow with SRI-Rice at Cornell, presented a seminar entitled Building a Research Network: An analysis of journal articles on SRI in India on January 28, 2014, in 102 Mann Library at Cornell University. 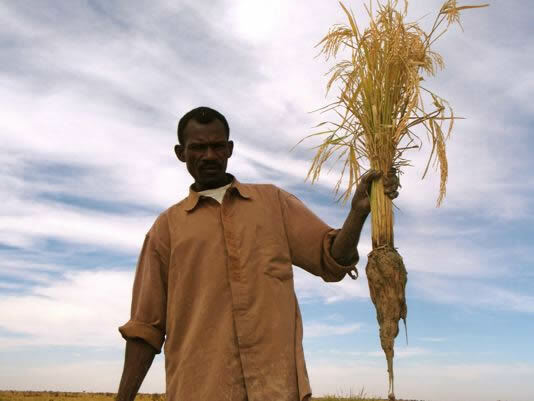 SRI-Rice has been nominated for the 2013 Katerva Food Security Award! The Katerva Awards are a new international prize for the most promising ideas and efforts to advance the planet toward sustainability. 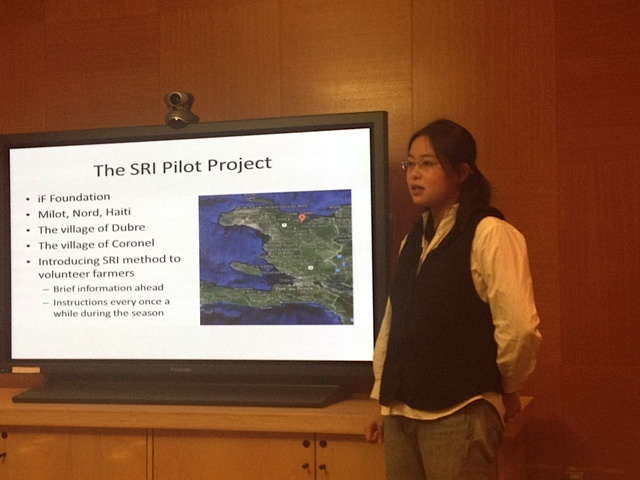 Zhoucen Feng, SRI-Rice intern, presented a seminar to the SRI-Rice Group and the Cornell Community on her SRI Experiences in Milot, Haiti on January 13, in 100 Mann Library, Cornell University. During the latter half of 2013, she helped a pilot SRI project being conducted by the iF Foundation project in Milot to correctly collect harvest data and test several cell phone-based data collection models. SRI-Rice Senior Advisor Norman Uphoff, together with Amir Kassam and Amod Thakur, edited a recent issue of the Taiwan Journal of Water Conservancy, which is devoted to System of Rice Intensification. Volume 64, no. 4 of the TJWC contains 10 articles, all of which consider various aspects of water use with SRI. The journal articles are in English with Chinese language abstracts included. The editors also authored the first article in issue no. 4: Challenges of increasing water saving and water productivity in the rice sector: Introduction to the System of Rice Intensification (SRI) and this issue.